The mission of any professional dental hygienist is to offer high-quality preventive dental care for patients (cleaning patients’ teeth with various tools and applying dental equipment properly). The candidates should be aware of certain principles, requirements, and rules before applying. In order to apply for the dental hygiene program, the overall GPA should not be less than 2.5. Basic admission process also involves possessing at least five full-year university classes behind. All the scores on the standardized test have to be positive, no matter what subject is considered. An obligatory admission requirement is a one half-year class in introductory statistics. To apply, all candidates should develop and submit a corresponding application letter, including the reasons for choosing this area, their goals, and recent academic achievements. University is a preferred institutional type. Non-academic factors like extra volunteering or internship experience may play a role as well. A degree in dental hygiene must be provided to get enrolled in the Bachelor program. At least 15 credit hours have to be accomplished. As a rule, all applications are submitted before March, 15th, but there are some exceptions that allow applying by June 1. The basis for the dental hygiene consists of health sciences, biology, psychology, chemistry, mathematics, and communication. Accept for these basic academic subjects, there are more complex disciplines to master. Speaking about classes for this career, an applicant should complete the following disciplines: liberal arts (e.g., English language, leadership, management, second language, sociology and psychology); basic sciences (e.g., anatomy, pharmacology, immunology, chemistry, and pathology); and some clinical sciences like dental hygiene and radiology. The first pre-requisite needed for becoming a dental hygienist is a high school diploma. Among all subjects, it is necessary to be engaged in such classes as biology, mathematics, and chemistry. To gain the job in the field of dental hygiene, an applicant must possess a certificate or one of the associate’s degrees in healthcare (specifically dental hygiene). Licensing is another obligation for each potential dentist or another dental hygiene representative. 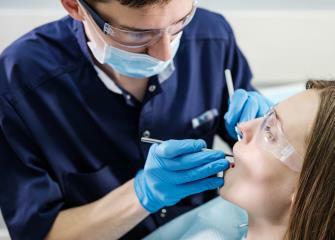 Many dental hygienists work as private faces, so they remain independent from clinics. Some of them open own private clinics instead of working for public places. It makes their schedule very convenient. There is no need to come to the office more than few times a week. Most of the dental hygienists attend their offices only when there are appointments made with their clients. The rest of the dental hygienists works from six to eight hours per day. To sum up, an average dental hygienist work approximately 18-24 hours per week, which is more than flexible. Dental hygienists rarely work for fixed wages: their payment is based on the number of patients and service quality. As PayScale reports, the average salary of a dental hygienist in the US varies between $45,587 and $86,914. It means that this specialist earns about $24.31-$42.13 per hour. In addition, there is an opportunity to gain up to $60 for overtime. In general, the positions associated with dental industry are very perspective in both America and Europe. It is connected with the oral hygiene popularity and number of people experiencing problems with their teeth. The Bachelor of Dental Hygiene classes involves 30 credit hours. For this highly responsible occupation, an applicant should also follow a range of healthcare requirements such as TB testing, CPR, criminal history, clinic attire, asepsis protocols, and immunization. In the majority of the states, American Dental Association’s Joint Commission on National Dental Examinations offers the most credible examination for further career in this field. The admission process is based on the successful academic performance and GPA. There are about 330 CODA-accredited dental hygiene programs in the United States. Business Administration degree and additional training programs increase the chances to win the dental job. According to Career Cast, dental hygienists have to visit their office 2-3 times per week. According to Bureau of Labor Statistics, more than a half of dental hygienist work on a part-time basis, so this job is rather flexible. On the whole, to earn a job in the field of healthcare, one should possess a perfect health condition.